I know that some of you (maybe all of you?) reading here think I'm crazy for trying to do 120 charity quilts a year. Well, I really would be, except that I have help. I freely admit that. If not, I wouldn't have time to do anything else except these. 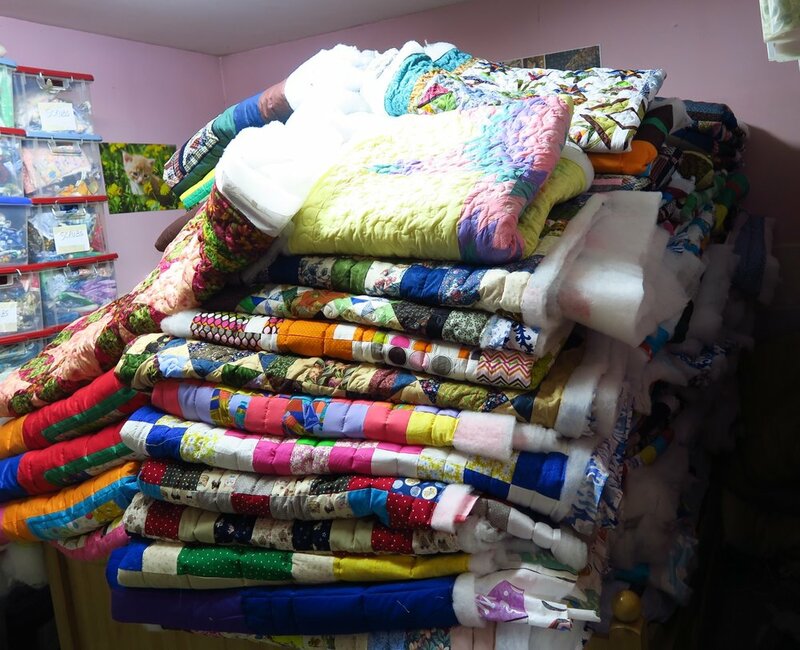 This is a picture of 120 charity quilts untrimmed and unbound. (Isn't that the same answer as to why do people climb mountains - Because they are there!) I know that God has given me the ability to make this many and we certainly have the contacts to be able to give them away, so why not? We have a charitable organization here in Poland as well, and I like to be able to say that it is one of the things that we do to help the poor in our area. In Poland we use heat from October well into April - and possibly early May, depending on the year, so quilts are very practical. But underneath the practical aspect is something far deeper. Galatians 6:10 says that " Therefore, as we have opportunity, let us do good to all people, especially to those who belong to the family of believers." I think that verse speaks for itself. These are my tips and tricks to help keep myself on track. 1. I'm trying to get these all done early this year. I think, just like it has been shown that a person has more willpower in the morning, I think I have more "quilting willpower" early in the year. I'm kind of afraid if I don't do them early in the year, other things will take over and I won't get them done this year and I really want to finish my goal this time. I decided to try to tackle them early in the year, working VERY hard, and then I'd have them off my mind. These are tops that my sis and I prepared last summer when she was here. There are a lot of panels here and cheater quilt fabric that I made into panels for the men, especially, since they are the dark colors that they seem to like. I'd then be free to do a little more creative pattern designing and quilting. Then in midsummer when it it hot, or when I'm feeling the need for a mental break, I can make more tops for next year. By having over 100 tops ready this January, I've been able to do this. 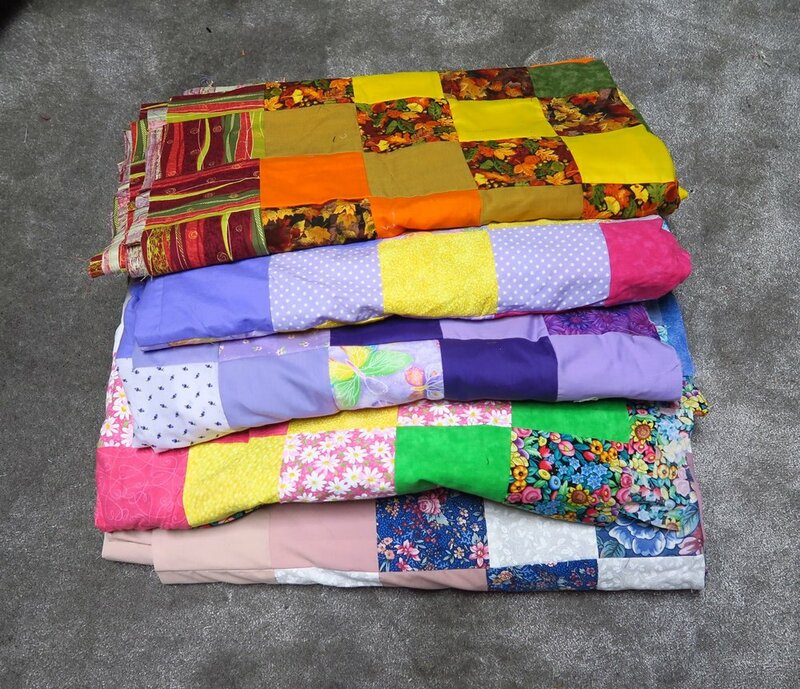 Without having that huge stack of tops, there is simply no way I could have already quilted 120 quilts. 2. I'm writing down my goals and encouraging myself with quotas each day in order to keep myself motivated. Buy the batting - at least one roll but two rolls if a holiday is coming up and I can't get to the store. Add labels/make labels as needed - I'm going to need more labels as I'm going to run out about half way through these quilts. Take it to the church building in groups of 10 where they can wait out of the way until it is time for someone needy to take it home. I finished quilting all 120 of those charity quilts on Feb. 7 just before noon. Now, I've started binding. I'm hoping to bind 6 a day and if I can do this huge task, I can finish them by the end of February. I'm hoping that both my hand will hold out (from trimming - I don't want blisters where I hold the scissors) and my arm, from horsing the quilts around when I bind - I do machine binding. 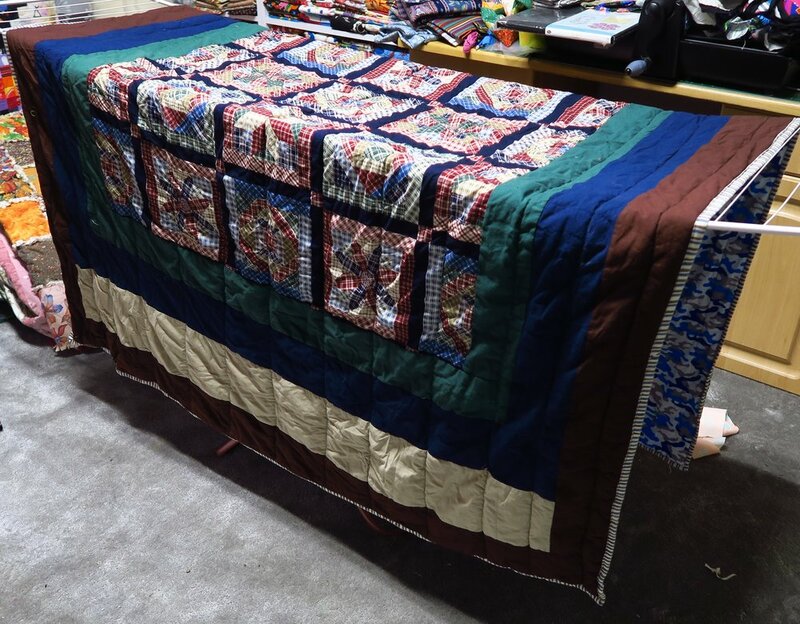 This was number 119 and another HUGE quilt. It was gorgeous and I'm still pinching myself that someone donated it. I'm pretty sure it's a king size. At least it felt like it! I'll make sure this one goes to a couple who will appreciate it. I'm going to do two kinds of binding - I'm planning on continuing working with my binding attachment and learning to use it better. This makes a single binding - not a doubled thickness which I'm not as crazy about. I am also using a double thickness binding using some fabrics that won't work with the binding attachment. I will wash each quilt after it is bound. I can only wash one at a time, though. This will take a long, long time. Each load takes 1.5 hours. I do my best to only wash during the cheap time (we have a two tiered rate structure). Thankfully from Friday at 10 pm til Monday at 6 am, - all weekend--it is cheaper, so I'll try to really ramp up the washing on the weekends. We also get every night and two hours during the day. My washing machine can be set to go on at a certain time, so as I write this, I have one scheduled to start tonight and be done when I get down for breakfast. I can then set up another one to start when the cheap time starts in the afternoon. It all takes a lot of organization. My first charity quilt on the drying rack. It will take a while for 120 quilts to go through this cycle, but since it costs nothing for this type of drying, I can wait. 4. I'm using my white board freely. I've been changing the numbers as I finish things. 5. I am sending my sister pictures - just to keep myself motivated. As the numbers increase, it feels really great. Of course she sends kudos and cheers my way. That helps. This beautiful but enormous lone star was the last charity quilt that I quilted for now. This was number 120. And....I don't mind the binding at all, because I like how they look once they are bound! And that's how I am tackling doing 120 charity quilts! My starter tops for the next group. I also have a collection of bigger panels (a couple) and several pillow panels that I can "build on" to make some more tops. People like those a lot. And oh yes...I do have these tops left to finish. However, I'm taking a break after I finish these 120 and I'm using these as starters for the next 120 I need to get ready. And if you need something for your sewing, don't forget to check out the store. I'm sure my sis has something for you!